Decoration Canon tables decorated with coloured interlaced geometric and foliate patterns (ff. 4-11v). 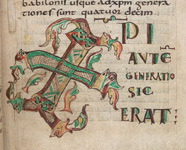 5 large initials in colours decorated with interlaced foliate and zoomorphic patterns, with display script, at the beginning of the Gospels and Matthew 1:18 (ff. 13, 68v, 107, 162). 4 smaller initials with similar patterns and display script (ff. 66, 67, 193v, 194), and some small initials in colours in the text. First letters of verses highlighted in red, yellow, or green. Decorated quire signatures. Binding BM/BL in-house. Rebound in 1874. Provenance Æthelstan [Athelstan] (b. 893/4, d. 939), king of England; possibly given by him to St Augustine's Abbey, Canterbury: inscribed in a possible imitation of the 10th century Anglo-Saxon square minuscule (see Keynes, 1985, pp. 165-70): 'hunc codicem Ædelstan rex devota / mente Dorobernensi tribuit eccl[esi]e / beato Augustino dicate et quisquis / hoc legerit omnipotenti pro eo pro/que suis fundat preces' (f. 3v). Drawings of a head of an eagle and of an inclined human head of f. 3v visible in video spectral comparator, 10th century (see Keynes, 1985, pp. 167-69). Inscribed, 'Diamate', and 'Umfridus me fecit', 14th century (f. 3). Thomas Lee, John Birchyton, John Hinstyde [or Lynstyde], inscribed with their names, 15th century (f. 8v). N. Hersth, inscribed with his name, 15th century. John Leland (b. c.1503, d. 1552), poet and antiquary, inscribed with his name: 'Joannes Lelandus / Æthelstanus erat nostre pars maxima cure. / Cuius nota mihi bibliotheca fuit. / Illo sublato sexcentos amplius annos. / Puluere delitui squasidus atque situ. / Nunc pietas sed me superas revocavit ad auras. / Henrici digno restituique loco' (f. 3v). Henry VIII (b. 1491, d.1547), king of England and Ireland, probably appropriated by him at the dissolution of St Augustine's abbey (see Leland's inscription above). Drawing of the Virgin and Child, 16th century (f. 199v). John Lumley, 1st baron Lumley (b. c. 1533, d. 1609), collector and conspirator: inscribed with his name (f. 4); listed in the 1609 catalogue of his collection, no. 303 (see The Lumley Library, 1956); his library acquired by Henry, prince of Wales. Henry Frederick, prince of Wales (b. 1594, d. 1612), eldest child of James I: his collection became part of the Royal Library: included in the catalogue of 1666, Royal Appendix 71, f. 3; and in the 1698 catalogue of the library of St James's Palace (see Catalogi librorum manuscriptorum Angliae et Hiberniae (Oxford: Sheldonian, '1697'), no. 7905). Notes Includes Canon tables (ff. 4-11), the Epistle of Jerome to Damasus (ff. 193-194), the extract from Jerome's commentary on Matthew (ff. 194-196) and the Epistle of Eusebius to Carpianus (ff. 196-196v). Quire signatures in the form of Roman numerals, I-IX (ff. 19v-98v) and letters. Unusual punctuation in the form of 2 dots and a comma, also found in London, British Library Additional manuscript 9381 from Bodmin, Cornwall. Select bibliography E. Maunde Thompson and G. F. Warner, Catalogue of Ancient Manuscripts in the British Museum, 2 vols (London: British Museum, 1881-1884), Part II Latin, p. 37. Frederick Henry Ambrose Scrivener, A Plain Introduction to the Criticism of the New Testament, 4th edn, ed. by Edward Miller, 2 vols (London: George Bell & Sons, 1894), II, p. 75. George F. Warner and Julius P. Gilson, Catalogue of Western Manuscripts in the Old Royal and King’s Collections, 4 vols (London: British Museum, 1921), I, p. 12. Julius P. Gilson, Description of the Four Gospels in the Library of York Minster, (York: Ben Johnson, 1925), p. 5. H. H. Glunz, History of the Vulgate in England from Alcuin to Roger Bacon (Cambridge: Cambridge University Press, 1933), no. 19. Theodor Klauser, Das römische capitulare evangeliorum: Texte und Untersuchungen zu seiner ältesten Geschichte, Liturgiegeschichtliche Quellen und Forschungen. 28 (Munster: Aschendorffschen, 1935), p. XXXVI. Geneviève Louise Micheli, L’Enluminure du haut moyen âge et les influences irlandaises, (Bruxelles: Édition de la Connaissance, 1939), p. 100. D. Talbot Rice, English Art 871-1100, Oxford History of English Art, 2 (Oxford: The Clarendon Press, 1952), p. 35. Medieval Libraries of Great Britain: A List of Surviving Books, ed. by N. R. Ker, 2nd edn, Royal Historical Society Guides and Handbooks, 3 (London: Royal Historical Society, 1964), pp. 44, 243, 361. Francis Wormald, An Early Breton Gospel Book, ed. by Jonathan Alexander (Cambridge: Roxburghe Club, 1977), p. 5, 13 n. 1, pl. xxxivd. Andrew G. Watson, Catalogue of Dated and Datable Manuscripts c. 700-1600 in The Department of Manuscripts: The British Library, 2 vols (London: British Library, 1979), I, no. 853. F. A. Rella, 'Continental manuscripts acquired for English centers in the tenth and early eleventh centuries, a preliminary checklist', Anglia 98, (1980), 105-16 (p. 112). Simon Keynes, 'King Athelstan's Books', in Learning and Literature in Anglo-Saxon England: Studies Presented to Peter Clemoes, ed. by Michael Lapidge and Helmut Gneuss (Cambridge: Cambridge University Press, 1985), 143-201 (pp. 165-70). Bonifatius Fischer, Die Lateinischen Evangelien bis zum 10. Jahrhundert, 4 vols (Freiburg: Herder, 1988-1991), I: Varianten zu Matthäus, Vetus Latina die Reste der Altlateinischen Bible: Aus der Geschichte der Lateinischen Bibel, 13, p. 18. Jennifer O’Reilly, 'The Book of Kells and Two Breton Gospel Books', in Irlande et Bretagne: vingt siècles d’histoire: Actes du colloque de Rennes, 29-31 Mars 1993, ed. by Catherine Laurent and Helen Davis (Rennes: Terre de brume, 1994), pp. 216-27 (pp. 222-24). Patrick McGurk, ‘The Disposition of Numbers in Latin Eusebian Canon Tables’, in Philologia Sacra: Biblische und patristische Studien für Hermann J. Frede und Walter Thele zu ihrem siebzigsten Geburtstag, ed. by Roger Gryson (Freiburg: Herder, 1993), pp. 242-58 (p. 257). Olivier Szerwiniak and Patrick Mc Gurk, 'Des recueils d'interprétations de noms hébreux (suite)', Scriptorium: revue internationale des études relatives aux manuscrits médiévaux, 50 (1996), 117-22. Richard Marsden, 'Ask What I am Called': The Anglo-Saxons and Their Bibles', in The Bible as Book: The Manuscript Tradition, ed. by John L. Sharpe III and Kimberly Van Kampen (London: British Library, 1998), 145-76 ( p. 175). Adam S. Cohen and Elizabeth C. Teviotdale. 'The Getty Anglo-Saxon Leaves and New Testament Illustration around the Year 1000', Scriptorium: revue internationale des études relatives aux manuscrits médiévau, 53 (1999), 63-81 (pp. 61 n. 22, 69, pl. 21). The Libraries of King Henry VIII, ed. by J. P. Carley, Corpus of British Medieval Library Catalogues, 7 (London, 2000), pp. xlv, xlvi. Helmut Gneuss, Handlist of Anglo-Saxon Manuscripts: A List of Manuscripts and Manuscript Fragments Written or Owned in England up to 1100, Medieval and Renaissance Texts and Studies, 241 (Tempe: Arizona Center for Medieval and Renaissance Studies, 2001), no. 444. James P. Carley, The Books of King Henry VIII and His Wives, preface by David Starkey (London: British Library, 2004), pl. 87. Catherine E. Karkov, 'Evangelist Portraits and Book Production in Late Anglo-Saxon England' in The Cambridge Illuminations: The Conference Papers, ed. by Stella Panayotova (London: Harvey Miller, 2007), pp. 55-63 (p. 55 n. 8). St Augustine's Abbey, Canterbury, ed. by B. C. Barker-Benfield, Corpus of British Medieval Library Catalogues, 13, 3 vols (London: British Library, 2008), pp. lv, cii, n. 103, 1654, n. 42, 1696, 1734, 1796. Richard W. Pfaff, The Liturgy in Medieval England: A History (Cambridge: University Press, 2009), p. 69.